Tired but inspired after doing 3 shows in London: Agnes Martin and Sonia Delaunay at Tate Modern and Joseph Cornell at the RA. 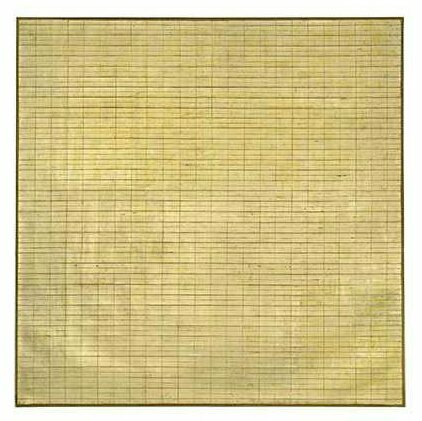 After just three rooms of Agnes Martin I was ready to call it a day: either call it a day for my art career – for what point when she has done so much of what I’m exploring – or call it a day and go back home to the studio and get to work with renewed fire and vigour! As it happened I forced myself to be disciplined and make the best of the day in London. I had been really looking forward to seeing Martin’s work after being recommended by a friend. I wasn’t disappointed, though the quality was variable ranging from averagely interesting to sublimely beautiful and completely enveloping. Some of the early work and some of her last seemed to lack a positive spark, seemed to be floundering, looking for a connection. The rest was hard-wired to her muse. Most of it I would love to take home with me and look after lovingly! I may write in more detail about particular pieces, but over all I felt she was investigating similar areas to my current and recent work, that there is more than a superficial similarity in the way the finished pieces look. I only scooted round the Delaunay because I was with my daughter and thought she may be interested in the costume and textiles. It was nice to reconnect to a few favourite pieces from my last visit, but it didn’t add to the positive inspirational effect of the day so far. The Joseph Cornell was a disappointment and a delight: irritating and inspirational. I first came across his work in the early 1970s but never got to see the show in London around that time. At that time I was making sets and boxes – in a very different style – and was very drawn to and, possibly, influenced by his work. The disappointment was that photographs have shown them brighter and somehow more polished. In the flesh they seem a little dull. The delight was in the detail. If I had seen them in the seventies I would have been put off by the apparent slapdash construction, but now I can accept and cherish the poor mitres and uneven paintwork: it’s the ideas that captivate and intrigue and they are mostly put together perfectly. There was less humour than I expected: quite a few had fairly dark subject matter. I liked that many were physically dark, making you work to see what was there. I liked that the show connected me back to the best of the ideas and materials I was exploring back in college days that I have started to tinker with again. This entry was posted in Exhibitions and tagged Agnes Martin, Art, Delaunay, Exhibitions, Joseph Cornell, London on 13 July 2015 by David Smith.